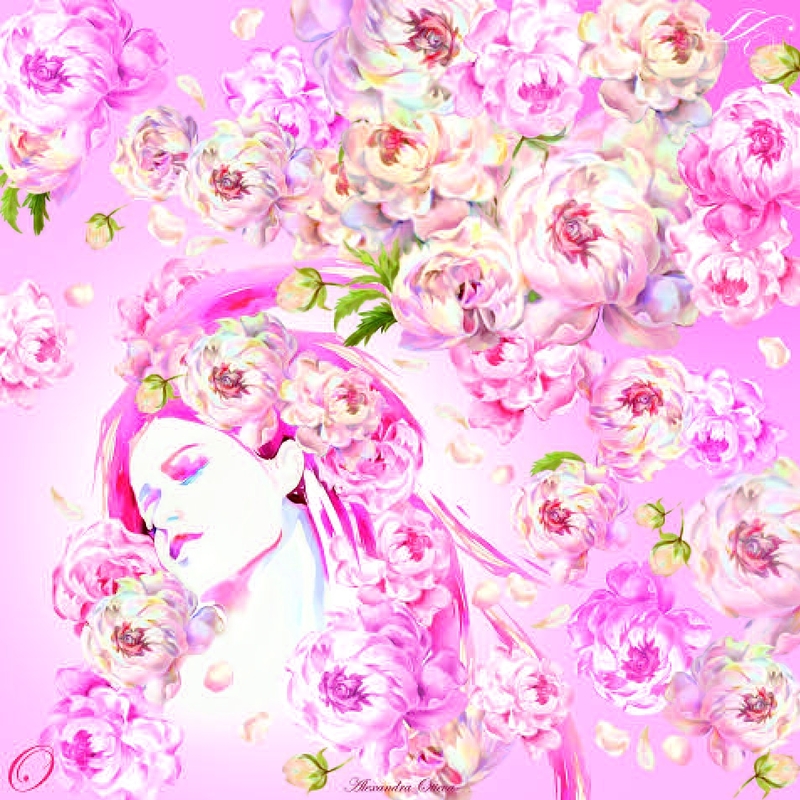 Alexandra Otieva refers to the type of artists who do not get tired of experimenting, revealing new features of the creative self, showing an inexhaustible fantasy. At the same time, she is a wonderful example of self made personality, walking along the path of creativity with confidence, showing excellent business qualities. Constant exhibitions, new publishing plans, creation of a collection of author's handkerchiefs – there are so many things that we may just wonder how a fragile beautiful woman succeeds in doing all this? We will ask Alexandra about the secret of success and plans for the future. Alexandra, you are already famous for your amazing watercolours. A series of landscapes, still lifes, author sketches remains in memory for a long time. But today you prefer the creation of author's handkerchiefs. What is the reason for such a transition from one type of creative activity to another? Indeed, for more than 15 years I have been working in the watercolour technique on a wet paper – one of the most complex techniques, when paints are applied by the artist on a wet sheet in one go. Intuition is important, a certain foresight, because even an experienced artist cannot always predict the final result. A competent watercolour technique is very important. I have been sharpening my skills for many years, while listening to the inner voice in choosing plots, in the vision of the world. I was inspired by the trips that gave me great material for creativity, by the blooming of various plants and flowers, which turned out to be an inexhaustible storehouse of ideas and colour combinations – from light pink to deep violet in combination with yellow, red and blue. It is not by chance that one of the most fruitful series in my work is floral still lifes. The attempt to use a floral pattern as a print on the fabric was unexpected. Preparing for a solo exhibition in 2014, I used one of the paintings "Peonies in bloom" as a pattern for the fabric of the dress, which was made especially for the exhibition opening ceremony. In my opinion, it turned out to be harmonious ... and promising, because today the scope of creativity is expanding – it seems to me, due to the synthesis of artistic forms. The idea can be general, and the forms of implementation are different depending on the imagination of the artist. So, the author's creation became the starting point for an applied work. But I'll tell you another secret. Not so long ago, my life changed dramatically: I became a mother, and with the appearance of the baby the whole life of my family was reconstructed. Today priorities are different – the child has become the centre of our universe. In a way, he became the organizer of my work as well. I myself, without a nanny, do my son, and while the kid does not go to the nursery, I combine creativity with caring for the child, which is not always easy. Now I'm limited to the time frame and cannot paint pictures, as before, for several hours in a row, secluded in the studio. Maybe this is what served as an impulse to fulfil my old dream and create silk handkerchiefs. After all, you can think, develop a design and a concept at any time, interrupting and returning to the plan again, reworking and improving it to achieve the desired result, and you cannot afford it with watercolours on a wet sheet, when you cannot stop until you finish the work. Tell us more about the scarves. After all, unlike easel works, objects of applied nature perform utilitarian function. 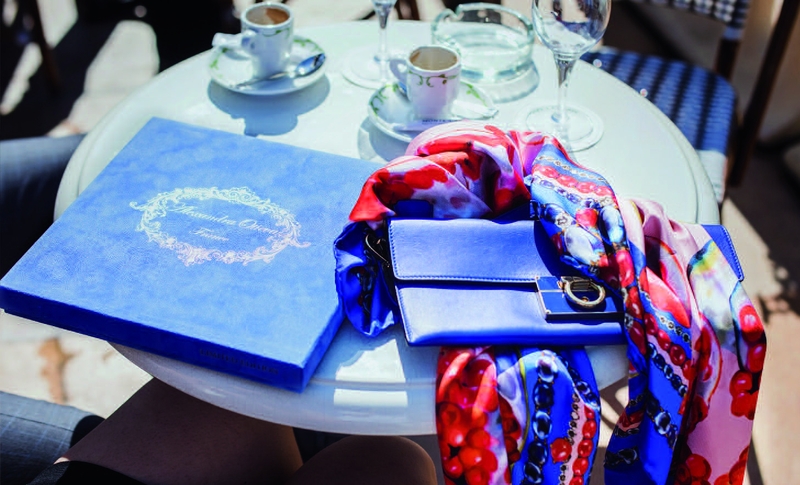 To what extent is it possible to maintain the creative thought of watercolour while applying it onto the scarf? In the design of one of my new scarves I used a conceptual approach: from natural – to the one created by a talented jeweller. In the centre, there is the graphic sheet "Pomegranate", the grains of which are full of life blood, are saturated with colour and life, and the rim is framed by a fantasy of jewellery with a garnet stone used in the products by my beloved Italian jewellery house Bulgary. 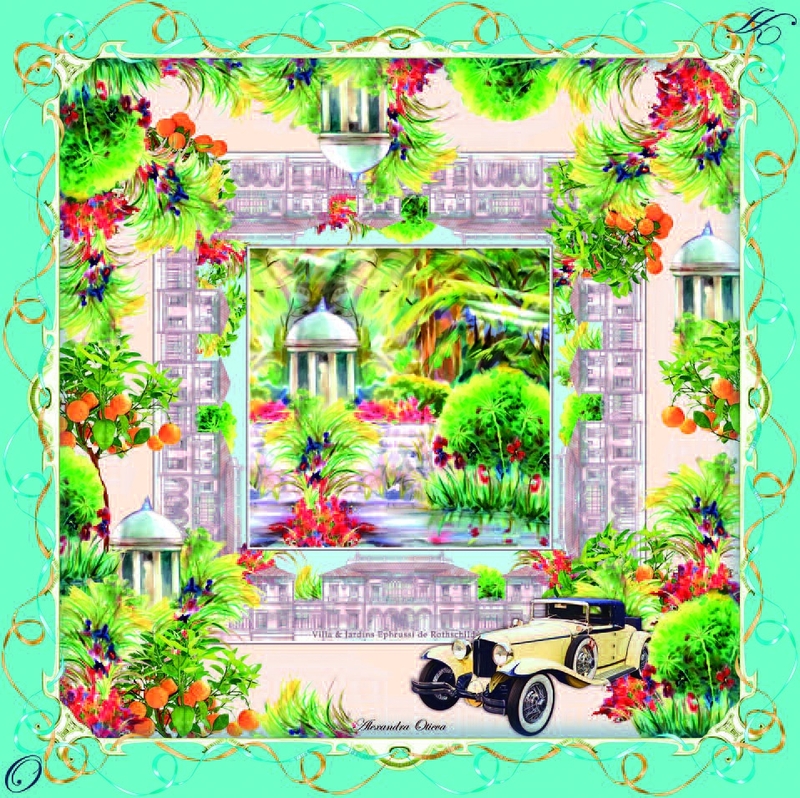 Then came the scarf "Côte d'Azur, or the French Riviera", dedicated to the villa museum of Ephrussi de Rothschild and its gardens, it is there where I will present this scarf and my works at the Rose and Plant Festival on Saint-Jean-Cap-Ferrat on May 6-7. I painted a few pictures especially for this event. Now I'm working on the scarf "The Garden of Eden" from the autumn collection. And if the message of the former is generally clear, then the latter was semantic for me. The Garden of Eden is a reference to a story from the Bible. The Book of Genesis says: "A river came out of Eden to water Paradise and then was divided into four rivers ..." The Garden of Eden is the symbol of the beginning, the point where everything begins – the life of people on the Earth, and the creative path, sometimes winding and torturous. By the way, geographically these two stories are in some way connected: the Côte d'Azur is in the same area, in the Mediterranean, where, according to one of the esoteric versions, the Garden of Eden was located. Today your activity is closely connected with the manager work. Sometimes it is dangerous for creativity. How to remain a creative person? What should feed your creativity? Source of inspiration is in creativity as well: to present some works before a demanding and sophisticated audience, one need to create interesting things. And creative search is indispensable there. But the exhibition plan is really tight for me. This year in early March, a solo exhibition was held at the National Monaco Committee of the UNESCO International Art Association, where, in addition to the artwork, I presented a collection of scarves "Journey to a dream". On May 6-7, I will exhibit several works at the Ephrussi de Rothschild villa museum at the Rose and Plant Festival on Saint-Jean-Cap-Ferrat. On May 16-18 I will take part in the Fashion Week in Italy on the island of Ischia. On June 10 and 11 there will be an exhibition of my paintings from the "Flowers" series during the Anniversary 50th International Bouquet Competition held by the Garden Club Monaco in Chapiteau de l'espace Fontvieille. On June 24, my personal exhibition will open and last for a month in the city of Villefranche-sur-Mer, which, by the way, is associated with the Russians – it was here that the Empress Dowager Alexandra Feodorovna opened the Mediterranean to the Russian fleet in 1856, and then sponsored the first railway between Nice and Villefranche. This is one of the most beautiful bays that inspires me. After my son was born, I moved to this city. The mayor's office selected my works from among other artists' and offered me to carry out a solo exhibition. 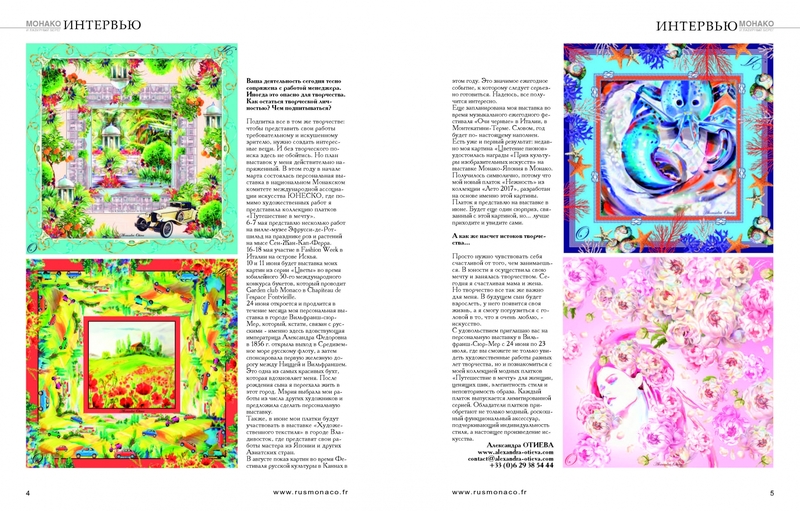 Also in June my scarves will participate in the exhibition of "Art Textile" in the city of Vladivostok, where masters from Japan and other Asian countries will exhibit their masterpieces. In August, there will be the display of paintings during the Festival of Russian Culture in Cannes this year. This is a significant annual event, which requires serious preparation. I hope everything will turn out to be very interesting. My exhibition is also planned during the music festival "Dark Eyes" in Italy, in Montecatini Terme. In a word, the year will be truly fruitful. There is already the first result: recently my painting "Peonies in bloom" was awarded the "Fine Arts Award" at the Monaco-Japan exhibition in Monaco. 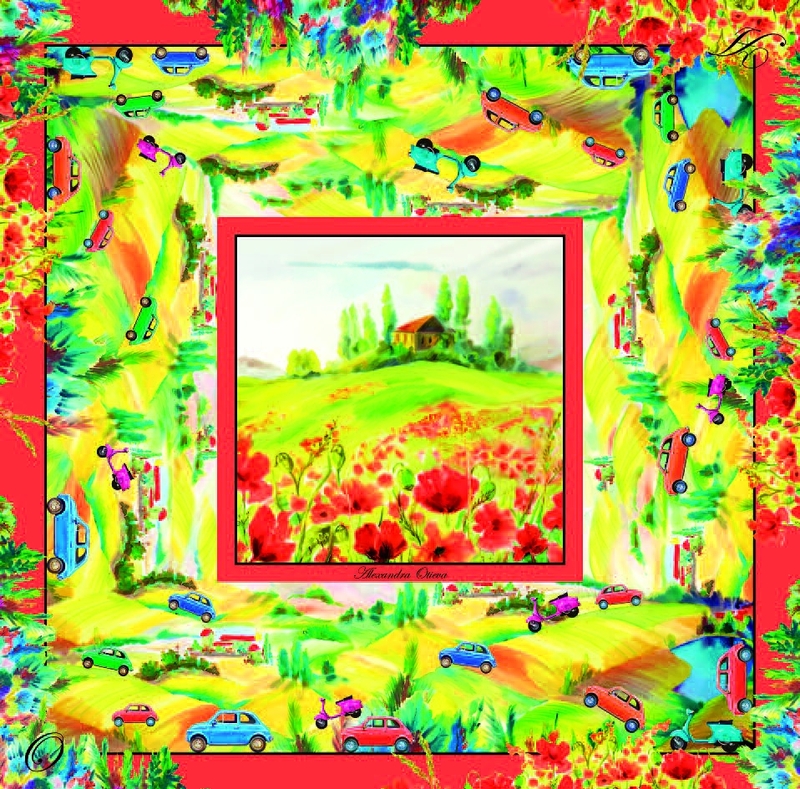 It turned out to be symbolic, because my new scarf "Tenderness" from "Summer 2017" collection is developed on the basis of this particular picture. I will present the scarf at the exhibition in June. There will be another surprise associated with this picture, but ... better come and see yourself. You just need to feel happy about what you are doing. In the days of my youth I achieved my dream and started to work. Today I am a happy mother and wife. But creativity is still important for me. In the future, the son will grow up, he will have his own life, and I then will be able to immerse myself into what I really love – into art. I am pleased to invite you to my personal exhibition in Villefranche-sur-Mer from June 24 to July 23, where you can not only see the artworks of different years of my creative development, but also get acquainted with my collection of fashionable scarves. Journey to a dream" is for women who appreciate chic, elegance of style and uniqueness of the image. 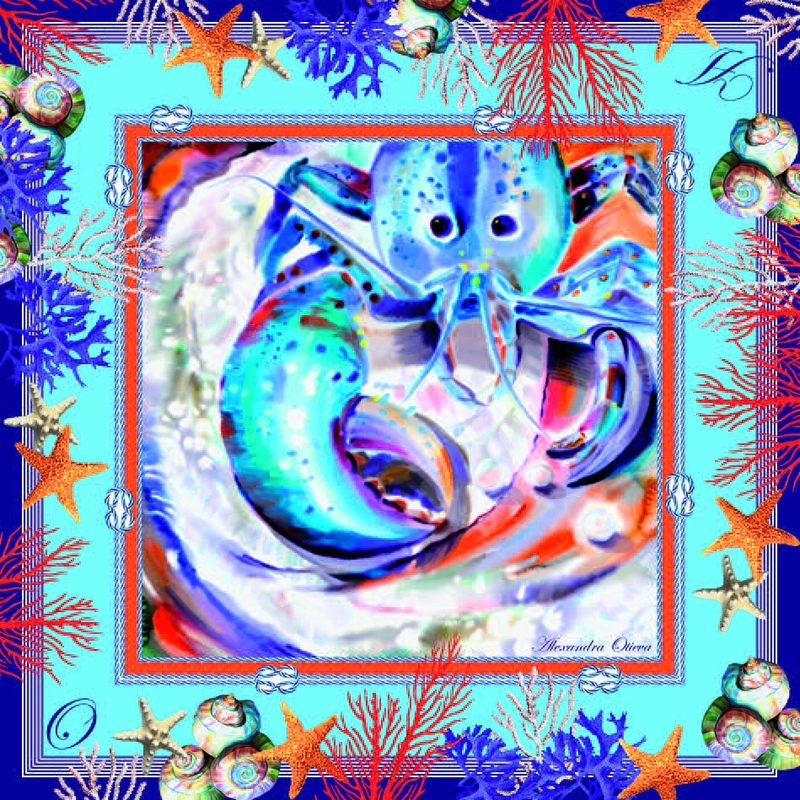 Each scarf is of a limited edition. The owners acquire not only a fashionable, luxurious functional accessory that emphasizes the individuality of style, but a real work of art.